Read book reviews for Disability Rights Advocacy Online: Information, Communication and Society; Disability & Society. Trevisan, F. (2018) “Connective Action Mechanisms in a Time of Political Turmoil: Virtual Disability Protest at Donald Trump’s Inauguration,” Australian Journal of Political Science, 53(1): 103-115. Reilly, P. and Trevisan, F. (2015) “Researching Protest on Facebook: Developing an Ethical Stance for the Study of Northern Irish Flag Protest Pages.” Information, Communication & Society, 19(3): 419-435. Pearson, C. and Trevisan, F. (2015) “Disability Activism in the New Media Ecology: Campaigning Strategies in the Digital Era,” Disability & Society, 30(6): 924-940. Trevisan, F., and Reilly, P. (2014) “Ethical Dilemmas in Researching Sensitive Issues Online: Lessons from the Study of British Disability Dissent Networks,” Information, Communication and Society, 17(9): 1131-1146. Trevisan, F. and Cogburn D.L. (2019) “Technology and Grassroots Inclusion in Global Governance: A Survey Study of Disability Rights Advocates and Effective Participation,” In Proceedings of the 52nd Hawaii International Conference on System Sciences (HICSS) – 2019, Wailea, HI, 7-11 January. Trevisan, F. (forthcoming) “Disability Media,” in L. Perez-Gonzalez, B. Blaagaard, and M. Baker (Eds.) Routledge Encyclopedia of Citizen Media, New York: Routledge. Trevisan, F. (in print) “Needs Must: Digital Innovations in Disability Rights Advocacy,” in Goggin, G., Ellis, K., and Haller, B. (Eds.) The Routledge Companion to Disability and Media, New York: Routledge. Trevisan, F., Hoskins, A., Oates, S., and Mahlouly, D. (2017) “Mapping the Search Agenda: A Citizen-Centric Approach to Electoral Information Flows,” in Wimmer, J., Wallner, C., Winter, R., and Oelsner, K. (Eds. ), (Mis)Understanding Political Participation: Digital Practices, New Forms of Participation, and the Renewal of Democracy. New York: Routledge. Trevisan, F. (2015) “Contentious Disability Politics on the World Stage: Protest at the 2012 London Paralympics,” in Jackson, D., Molesworth, M., and Scullion, R. (Eds. ), Reframing Disability? Media, (Dis)empowerment and Voice in the 2012 Paralympics, London: Routledge, pp. 154-171. Trevisan, F. (2013) “Disabled People, Digital Campaigns, and Contentious Politics: Upload Successful or Connection Failed?,” in Scullion, R., Lilleker, D., Jackson, D., and Gerodimos, R., (Eds. ), The Media, Political Participation, and Empowerment, London: Routledge, pp. 175-191. Trevisan, F. (2012) “ICTs for Empowerment? Disability Organizations and the Democratizing Potential of Web 2.0 in Scotland,” in Manoharan, A., and Holzer, M., (Eds. ), E-Governance and Civic Engagement: Factors and Determinants of E-Democracy, Hershey, PA: IGI Global, pp. 381-404. Cogburn, D.L. and Trevisan, F. (2018) Accessibility in Global Governance: The (In)Visibility of Persons with Disabilities – Barriers to Effective Participation and Recommended Solutions. Washington, D.C.: Institute on Disability and Public Policy. 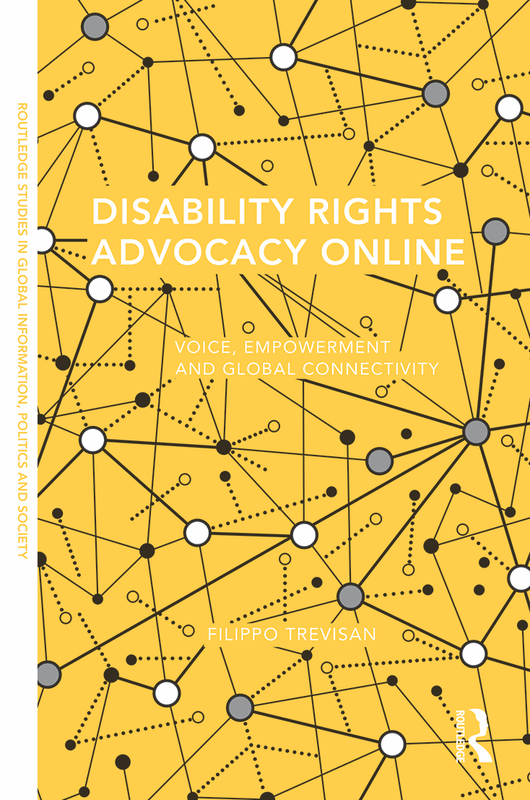 Trevisan, F. (2017) “Disability Rights Advocacy Goes Digital,” in Reilly, P., Veneti, A. and Atanasova, D. (Eds. ), Politics, Protest, Emotion: Interdisciplinary Perspectives, University of Sheffield Information School, pp. 157-161. Trevisan, F. (2016) “Organizing in Trump’s America: The Perspective of the Disability Community” in Lilleker, D., Thorsen, E., Jackson, D., and Veneti, A. (Eds.) U.S. Election Analysis 2016: Media, Voters and the Campaign. Centre for the Study of Journalism, Culture and Community at Bournemouth University. Trevisan, F. (2016) “The View from Across the Pond: Brexit on American Media” in Jackson, D., Thorsen, E., and Wring, D. (Eds.) EU Referendum Analysis 2016: Media, Voters, and the Campaign. Political Studies Association, Centre for the Study of Journalism, Culture and Community at Bournemouth University, Centre for Research in Communication and Culture at Loughborough University. Trevisan, F. and Reilly, P. (2015) “UKIP: The Web’s Darling?” in Jackson, D. and Thorsen, E. (Eds.) UK Election Analysis 2015: Media Voters and the Campaign. Political Studies Association and the Centre for the Study of Journalism, Culture and Community at Bournemouth University. Trevisan, F., Curl, A., Kearns, A., and Ellaway, A. (2014) “The Recession, Austerity Measures, and Health.” GoWell Program key findings report (University of Glasgow). Trevisan, F., review of Ellis, K. and Kent, M. (2011) Disability and New Media, London: Routledge, published in Information, Communication, and Society, 16(10): 1697-99. Trevisan, F., review of Baym, N. (2010) Personal Connections in the Digital Age, Cambridge: Polity, Urban Studies, Sept. 2012, 49(12). Cogburn, D.L., Trevisan, F., Spaniol, E., and Aguilar, M. (2017) “ICTs to Support Persons with Disabilities in Global Policy Development.” Paper prepared for the CSUN Assistive Technology Conference, San Diego, CA, 27 February – 4 March. Trevisan, F., Reilly, P., and Leyton-Escobar, M. (2017) “Telling it like it is: A Comparative Study on the Use of Personal Stories in Online Grassroots Advocacy.” Paper prepared for the International Studies Association’s Annual Convention (International Communication Section), Baltimore, MD, 22-25 February. Trevisan, F. (2017) “Technology, Voice, and the Problem of ‘Being Heard’.” Paper presented at the “Social Movements and IT Symposium” of the 50th Hawai’i International Conference on System Sciences (HICSS), Waikoloa, Hawai’i, 3-7 January. Trevisan, F. (2016) “The Personal Is Political: Online Disability Advocacy, Personal Stories and the News Media.” Paper presented at the American Political Science Association’s Annual Meeting, Philadelphia, 1-4 September. Trevisan, F. (2016) “The Personal Is Political: Promoting Disability Rights Online.” Paper presented at the International Communication Association’s Pre-conference “Powers of Promotion: Apprehending the Social and Political Impacts of Promotional Culture,” Tokyo, 8 June. Reilly, P. and Trevisan, F. (2015) “Online Research Ethics in High-Risk Places: Facebook and the Flags Protests in Northern Ireland.” Paper presented at the Information, Communication & Society conference on “Protest Participation in Variable Communication Ecologies,” Alghero, Italy, 24-26 June. Trevisan, F. and Reilly, P. (2015) “Populist and Popular? Tracking Citizen Interest in Anti-Establishment Parties with Google Trends.” Paper presented at the 2015 International Studies Association’s Annual Convention (International Communication Section), New Orleans, LA, 18-21 February. Trevisan, F., Hoskins, A., and Mahlouly, D. (2014) “Googling for Votes: Using Publicly Accessible Search Engine Data to Capture Information Flows in Elections,” paper presented the 2014 Political Communication Pre-Conference of the American Political Science Association, Washington DC, 30 August. Trevisan, F., Curl, A., Kearns, A., and Ellaway, A. (2014) “Financial Difficulties, Health and Wellbeing at a Time of Economic Recovery: Living with the Legacies of Austerity Britain,” paper presented at the European Public Health Conference, Glasgow, 20-22 November, . Reilly, P., and Trevisan, F. (2014) “Googling Anti-Politics: The Case of the UK Independence Party,” paper presented at the International Studies Association’s Annual Convention (International Communication Section), Toronto, March. Mahlouly, D., and Trevisan, F. (2014) “Googling for Heroes: Using Search Engine Accessory Tools to Study Political Turmoil in Egypt,” paper presented at the “Citizen Media” interdisciplinary workshop, University of Manchester, 27-28 Jan.
Trevisan, F., Hoskins, A., Oates, S., and Mahlouly, D. (2014) “The New Voter Ecology: Search Engines and Comparative Electoral Information Flows,” paper presented at the Media, Communication, and Cultural Studies Association (MeCCSA) annual conference, Bournemouth University, 8-10 Jan.
Trevisan, F. (2013) “Mapping the Search Agenda: A Citizen-Centric Approach to Information Flows in Elections,” paper prepared for the ECREA Communication and Democracy Section Annual Symposium, Ludwig-Maximilians University, Munich, Germany, 11-12 Oct.
Trevisan, F. and Reilly, P. (2012) “Ethical dilemmas in Researching Social Media Campaigns on Sensitive Personal Issues: Lessons from the Study of British Disability Dissent Networks,” paper prepared for the 4th European Communication Conference, European Communication Research and Education Association (ECREA), Istanbul, 24-27 Oct.
Trevisan, F. (2011) “Disabled People, Digital Campaigns, and Contentious Politics: Upload Successful or Connection Failed?,” Paper prepared for the annual conference of the Political Studies Association Media & Politics Group, University of Bournemouth, 3-4 Nov.
Trevisan, F. (2010) “More Barriers? Yes Please! : Strategies of Control, Co-optation, and Hijacking of Online Disability Campaigns in Scotland,” Paper presented at the 8th Political Communication Section Pre-Conference of the American Political Science Association, George Washington University, Washington DC, 1 Sept.
Trevisan, F. (2010) “Disabled people’s online “voices”? A case study of Scottish disability organisations and Web 2.0 democratic potential,” Paper presented at the annual Information, Communication, and Society Academic Symposium “Networking Democracy? New Media Innovations in Participatory Politics,” Babes-Bloyai University, Cluj, Romania, 25-27 June. “No Laughing Matter: Political Gaffes and Online Information Search in Election Campaigns,” invited seminar at the Philip Merrill College of Journalism, University of Maryland, College Park, 20 Nov. 2013. “Keep Calm and Tweet On: Digital Renewal in the British Disability Movement,” invited presentation at the Mediating Disability in Broken Britain event, ESRC Festival of Social Science 2012, University of Leicester, 9 Nov. 2012. Trevisan, F. (2012) “Export with Care: Lessons fro the Experiences of Disability Organizations with eCampaigning in Britain and America,” Paper prepared for the academic-practitioners knowledge exchange section of the 10th Global e-Campaigning Forum, St. Anne’s College, Oxford, UK, 21-22 March. “Disabled People, the Internet, and Political Participation: Spaces for the Empowerment of Marginal Citizens, or Digital Island for Political Outcasts?,” Department of Media and Communication, University of Leicester, 16 March 2011.